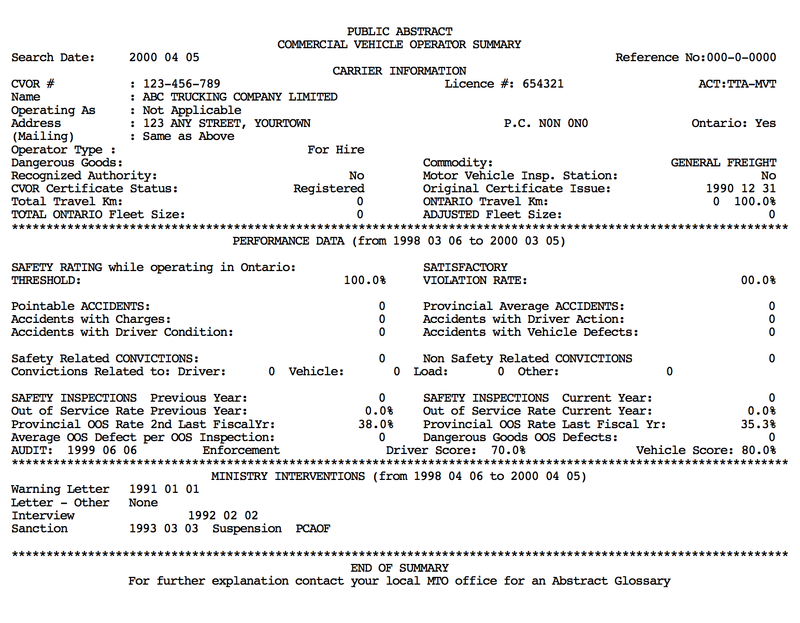 This story is common -A simple CVOR error sewers a trucking company. We work with our customers on a regular basis to improve operations, and we run into this all the time. We realized that if we can help you identify these 3 common errors sooner, it may make a huge improvement for your organization. The address listed on the CVOR must be the location of the operation and where the driver and maintenance files are located. In other words, if an MTO officer needed to find company officials and the data to perform an emergency audit quickly, what is the address? In many of the smaller companies, the company has listed the home address. This is not the address where the corporation is currently located. In many cases the company started out at home, performing the dispatch duties. Now that you have grown, you have moved out into business office space and maybe something with a yard. The address needs to reflect the location of the company between hours of operation. The Highway Traffic Act requires operators to report fleet size and travel information to the Ministry within 15 days after a change in the fleet size of 20 percent, or upon request. If the fleet size or rate of travel fluctuates throughout the year, the average rate of travel in Canada for the fleet operating in or through Ontario should be reported. A 20% change is not significant for smaller fleets, and it is often missed or forgotten. When you are running your day to day operation and your company has changed, it is tough. Whether the company is growing or shrinking by 20%, the change is difficult, and you will have many items on your mind. One extra thing that you need to keep in mind is to notify the ministry of the change in your companies fleet size or kilometers traveled. Driver Vehicle Inspection Reports (DVIR’s) are really important. One is usually issued every time your truck is inspected at a scale in North America. You need these reports. During an MTO Audit, the officer will ask to see all the DVIR reports that show on the Level II. The office will then match the DVIR with the maintenance files or driver files. Repair every defect found in the report and document the repair. When the driver gets a violation that needs to be “repaired” as well. You can document the training so that the driver will not make the same violation again. There you have it. The three most common CVOR errors. Which one(s) are you committing? Leave us a comment and let us know.